QSR Brands (M) Holdings SdnBhd (QSR): A franchisee of Pizza Hut in Malaysia. It is extensively involved in breeder and contract broiler farming, hatchery and poultry production and processing, as well as a host of ancillary businesses including baking, commissary and sauce production. Today, Pizza Hut chain has growth to more than 350 restaurants is the largest pizza chain in Malaysia, QSR Group is confident that its pizza chain will continue to completely dominate this sector and will be able to powerfully fend off any new competition. Pizza Hut featuring a delicious mix of nutritious Italian-American cuisine that includes the world’s favourite pan pizza and other signature dishes. There are two different concepts: Pizza Hut Restaurant & Pizza Hut Delivery. Pizza Hut Restaurant offers a cosy & friendly ambience coupled with great hospitality makes it the perfect place for one to relax, unwind & have a great time with family or friends. To add, Pizza Hut Delivery provides guaranteed hot & fresh pizza within promised delivery time in a convenient setting for added comfort. 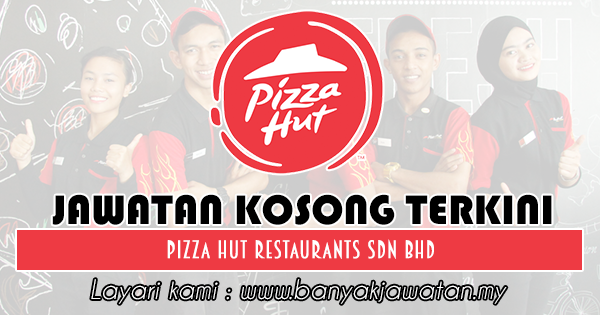 0 Response to "Jawatan Kosong di Pizza Hut Restaurants Sdn Bhd - 7 September 2018"